I have niece named Puchy (yes, it's a nickname) who is pregnant with twin girls. Yay!! 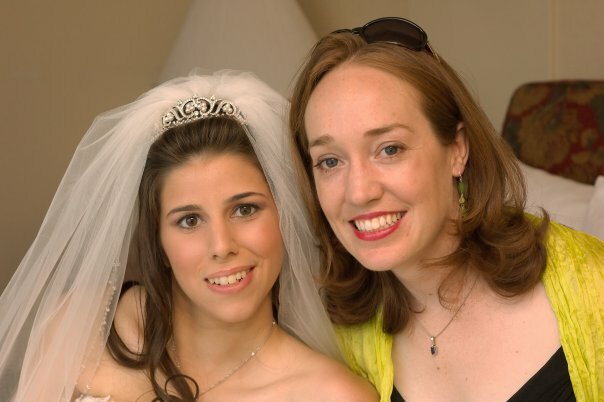 Here we are at her wedding a few years back. She's a beautiful person inside and out! So I've been working on making her a bunch of baby socks and hats to keep the babies nice and toasty warm. The pattern I came up with is super quick and easy. Great for when you need to make quite a few! Grab a hook and some yarn and let's get hooking! Fsc – Foundation Single Crochet (ch 2, insert hook into 2nd ch from hook, pull up loop, yo, pull through one loop, [foundation chain made] yo, pull through two loops, [fsc made]). To make the next fsc, insert hook into the foundation chain of the previous fsc, pull up a loop, yo, pull through one loop, yo, pull through two loops. Gauge: 7 stitches and 8 rows of sc is a 1 inch square. Size: Newborn, about 3.5 inches long. (If you'd like your socks to be bigger, you can increase the hook size and/or use a heavier weight yarn). Ch 6 making sure to leave a long beginning tail to weave up any potential gaps in the toe. Rd 1: 3 sc in 2nd ch from hook, 1 sc in next 3 ch, 4 sc in last ch, turn work and continue down other side of ch, 1 sc in next 3 ch, 1 sc in first worked ch, sl st to first sc of round to join. (14) Right Side. Rd 21-25: Ch 1, turn, 1 sc in each st around, sl st to first sc of round to join. (22) Do not fasten. Following Rows: Repeat rows 2 and 3 around edge of leg. With wrong side facing, sc edges of cuff together. With right side facing, join yarn in first fsc of round 20. With sock inside out, sc heel opening closed. Now whip up some V-Stitch Hats and you've got yourself a very lovely baby set! Omg I lovvvve these! Soo very cute. I must make a pair for my brothers new baby & for a baby shower I'm going to next week. That yarn is gorgeous & I love alpaca so much, but as a mommy I would not find time to hand wash the babies socks. ;) Love the pattern so much. Can't wait to try it & thanks for sharing! Thanks so much! I agree for older kids, but newborns don't generally need their socks washed very often if at all. I think if handwashing is an issue, maybe try super wash wool or cotton. Thanks for commenting! Hi! As a crocheter and an alpaca owner, now I won't work with anything else but alpaca yarn. Alpaca wicks moisture (and smell) away from skin, so even most adults don't need to wash socks after ever wash. However, just a little water in the sink with Dawn dish soap washes socks up really quick and then lay on a towel to dry. Also, when alpaca is blended with other, such as fine acrylic, the garment can be machine washed. One last thought, Yes Galler Yarns are fantastic! We carry them in our Shoppe here at our alpaca farm in Wisconsin. These are so cute! I want to make a few of the things you post and am considering purchasing a couple patterns you have on Etsy. Before I make a swatch, I was wondering if you crochet on the loose or tight side or in the middle. I tend to go down a hook size for most patterns because I crochet on the loose side. Thanks! I definitely am tight but i think I would stick with d unless the baby is really teency. Have fun! Hi Sarah, how do you make the socks stretchier? will crocheting in the back loops only for the sc help? Sc blo will make it length wise stretchy not width wise. You could add a few more stitches if you think they are too tight. Or do 1 more increase round at the toe. So grateful for the pattern and I am looking forward to trying this. Thank you, they are so cute!!! You can chain, but the instructions call for 7 fsc (foundation single crochet) then skip 7 st. Hope that helps! Rd 20: Turn, 7 fsc, sk next 7 st, 1 sc in next 15 st, sl st to first fsc of round to join. (22). So I have the foot of the sock and now I made 7 foundation single crochets and then it says skip the next 7 stitches, but I don't understand, because what is there to skip? if I look at the photo under Rd 20 I see that I have the same, but I don't know what I need to skip, because I am at the end of 7 f. single crochets.. hope you can help me! Just don't crochet in the next 7 stitches in the row below to create the hole for the heel. If yours looks like mine then you're fine. I'm a beginner but I think I could actually do these! THANK YOU for the step-bystep photos! Such an adorable knitted baby socks, thanks for the pattern. Try visit our page White + Warren for more knitted socks for baby. Thanks ! Thank for this simple and quick pattern! I used wool/mohair yarn with a 3.25mm and it's a little tight. I think next time I'll use a different yarn. Hi, I know this post is really old, but just in case you still check it I wanted to ask a quick question. How on earth do I work into both loops of my starting chain? I cannot even get started. Can I do the back loop only or will that mess up the pattern? Thanks! Where can I get a printable version or one I can save to my drive? It says at the beginning of the pattern to Chain "6"